I’ll be watching @midnight. see you there! Nick Cave anthology: ‘Read Write [Hand]’ (e-book). now that I got an e-reader (audience: “Finally!”), I’ll pick up this beauty. I like the idea of online playlists to accompany the text and illustrations. books as multimedia. too much NC!NC!NC! is barely enough. Money And Run (feat. 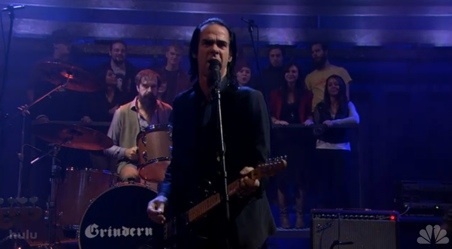 Nick Cave) by UNKLE on SoundCloud – Create, record and share your sounds for free. it’s gonna be epic. epic! rationale: no one in possession of their faculties agrees to be named Lincecum. Nick Cave’s dirty detour : The New Yorker. In the eighties, it looked as though Cave might become a darker, underground version of Elvis, but that time has passed, partly because his interests have changed. Now his profile is pleasantly complicated; in the past thirty years he has channelled a dozen different versions of the male psyche. To the rock audience, he is a highbrow front man who also writes novels and soundtracks, and pals about with artistes who wouldn’t be caught dead at a rock show where the audience is forced to stand. Grinderman 2 is here. on the first few listens, it comes across a bit milder than Grinderman – not as dissonant and electrified. more melodic and a bit tender. the influence of NC & The Bad Seeds is noticeable, same as Grinderman had a marked influence on Dig, Lazarus, Dig!! Mickey Mouse And The Goodbye Man by Grinderman. the entire album Grinderman 2: Enter the Wolfman is streaming in Grinderman myspace this week in advance of the album release next week, Monday September 13 in the UK and Tuesday September 14 in the US. as Nick is prone to, he namechecks poets in several songs. in We Call Upon the Author, who is this Berryman? understand he’d been a suicide went the Hemingway, but what about weirdly on wings and with maximum pain ? it didn’t take long to find out: poet John Berryman decided to discard his mortal coil by jumping on the Mississippi river from Minneapolis’ Washington avenue bridge one freezing January morning. he missed the river, hitting first the concrete pier and ending in the mud where he suffocated. I get the maximum pain. I do. three more songs that reference Berryman: Stuck Between Stations, Mama Won’t You Keep Them Castles in the Air Burning?, and most striking, John Allyn Smith Sails by Okkervil River, a biography of Berryman that by its end is intertwinned with Sloop John B. He said I’ve surrounded myself with doctors And deep thinkers. But he didn’t So he died. She said You’re pretty good with words But words won’t save your life. And they didn’t. So he died. I’m starting to read Berryman‘s Dream Songs.